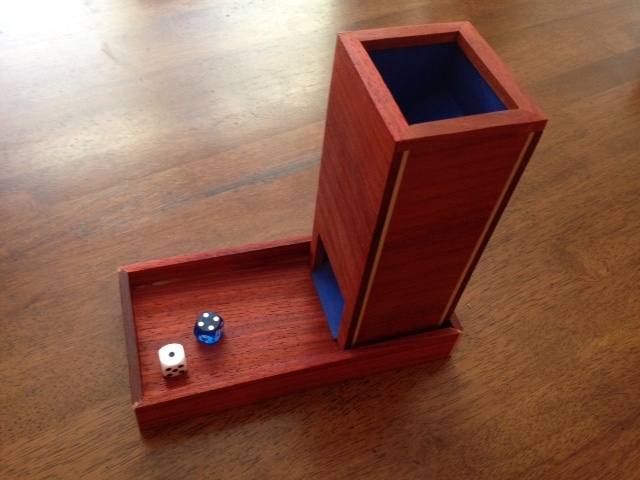 My foray into the harder than it looks world of making dice towers began about three years ago. My first attempt was made with plywood, nails,, and micro-suede. I wish I still had a photo of it because it was quite comical to look at. Slowly, with the purchase of more accurate tools, real wood, glue, and craft foam, the quality began to improve. I discovered some beautiful exotic wood and realized that sometimes the best stain is no stain at all. 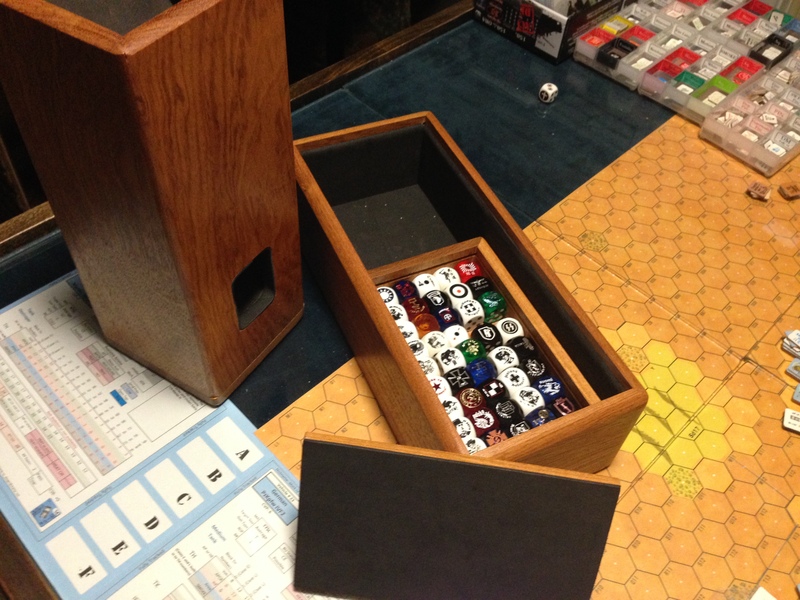 A real engineering problem was how to prevent the dice from jamming and how to use proper angles to prevent the dice from popping out of the tray, flying across the board, and unconcealing every dummy stack in my defense. 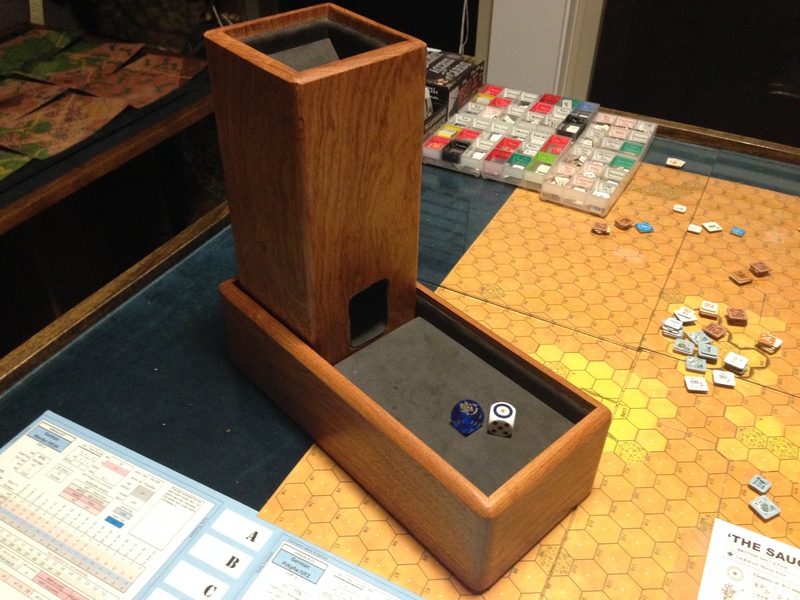 I set my goals to hope to one day approach the quality and finish of a ‘Pleva’ tower which are still to me, the Roles Royce of all dice towers. This is the most recent Tower I made. I has three parts to it: the tower, the tray, and the dicebox/rolling surface. It is made of solid walnut with no stain, just satin varnish. The interior is black and slotted into the wood so there are no edges that will peel back over time. Production time was around 15 hours. Here is a Video with this dice tower in action (I hope you took your blood pressure meds because this is pretty intense).